Paul G. Harris (ed. ), Europe and Global Climate Change: Politics, Foreign Policy and Regional Cooperation (Edward Elgar, 2007). The core objective of this book is to better understand the role of foreign policy – the crossovers and interactions between domestic and international politics and policies – in efforts to preserve the environment and natural resources. Underlying this objective is the belief that it is not enough to analyze domestic or international political actors, institutions and processes by themselves. We need to understand the interactions among them, something that explicit thought about foreign policy can help us do. Europe and Global Climate Change explores European and EU responses to global climate change. 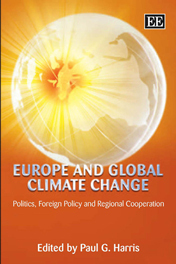 Major aims of the book are to analyze the “what, how and why” of climate change policies of several EU member states and of the EU itself (e.g., the European Commission and its agencies), and to supplement existing knowledge of climate change policies by explicitly adding environmental foreign policy analysis to the mix of tools used to understand those policies. The eclectic group of contributors explores European and EU responses to global climate change, and provides insights into issues on environmental protection, sustainable development, international affairs and foreign policy. While many important arguments are made throughout the book, the main one is this: analyzing and thinking about European climate change policies from the perspective of foreign policy will help us to better understand how and why Europe has responded to this issue and how (or whether) it will do so in the future.